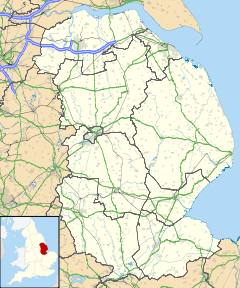 Barrow upon Humber is a village and civil parish in North Lincolnshire, England. Many of the buildings in the centre of the village are of 18th and 19th century origin. There are several buildings of note including Down Hall, Barrow Hall, Forester's Hall and West Cote Farm. There are two public houses: the Royal Oak and the Six Bells. A third public house, the Red Lion, situated in the lower High Street, reverted to a residence in the early 20th century. According to the 2001 census Barrow upon Humber had a population of 2,745. The village is located near the Humber, about three miles east of Barton-upon-Humber. The small port of Barrow Haven, 1.5 miles north, on the railway line from Cleethorpes and Grimsby to Barton-upon-Humber handles timber from Latvia and Estonia. The village is the home of Barton-upon-Humber Rugby Union Football Club, whose clubhouse is in Mill Lane.